As far as flood zones are concerned, I personally found the information available online about flood zones to be confusing to navigate and hard to understand. I was determined to find a faster, better way to tell whether my house was in a flood zone or not. #1 FloodSmart provides the most inclusive data — spelled out in layman’s terms — and points you to the official FEMA flood zone maps. If you want the most official data available online, start with FloodSmart. Simply click, FIND A FIRM, then enter your house address, city, state, and zip code. Click on SEARCH BY STREET ADDRESS, and you’ll get the official flood zone map for your area! Of course, this data is kind of hard to interpret. You need to know what the map codes mean. Fortunately, FloodSmart also has a quick & easy form that you could use instead. Just type in your street address, city, state, and zip code. Then you see a summary of your property’s flood risk. For my house it said, "This property is moderate-to-low risk." That, my friends, is the quickest way to determine if your house is in a flood zone or not! FloodSmart also goes a step farther to give you a general idea of what you can expect to pay for flood insurance, based on the flood risk associated with your property and the likelihood that your house could be affected by a flood in the future. $39 to $571 for "contents only"
$285 to $849 for "building only"
$119 to $1,385 for "building and contents"
From there, you can see the list of flood insurance agents in your area. Of course, you could also find your own if you were interested. 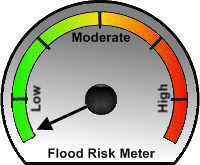 I find that type of Flood Risk Profile informative and helpful. Plus, it brings peace of mind — especially if you are using this information to get a quick feel for some property or a house that you are considering buying! #2 Is My House In A Flood Zone? is another quick & easy online tool that’s free. Using that particular tool, I learned, "This home is not likely to flood." It also showed a colorful chart which indicated just how low my flood risk really is at this property (very low). Beyond that, you get detailed flood data for your property, including your home’s exact GPS coordinates (longitude and latitude), the date the property was last assessed for flood risk, as well as the Map Panel number for the property. Since flood zones do change over time (due to new housing construction, flood prevention measures, drainage projects and new mapping techniques), you can also sign up to be notified if your home’s flood status should change. This service is free as well. Whew! After using the 2 FREE online tools above, you too can get a good feel for your own flood risk and determine once and for all if your house is in a flood zone or not. Keep in mind, insurance usually takes 30 days to take effect, so that means the flood insurance you take out today will not cover next week’s hurricane flood damage. Don’t wait for a hurricane warning to get flood insurance!